Part 35 of Wonders of World Engineering was published on Tuesday 26th October 1937, price 7d. 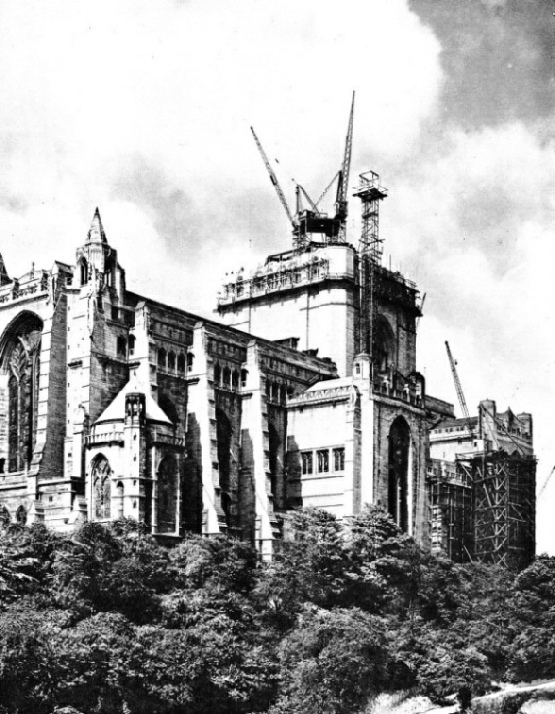 Part 35 includes a photogravure supplement showing the construction of Liverpool Cathedral. This section illustrates the article on Building a Great Cathedral. The cover of this week’s Part is produced from a photograph supplied by C A Parsons & Co Ltd, of Newcastle-on-Tyne. It shows a huge stator for a 36,000 kilovolt-amps alternator. The development of the turbo-alternator and of other electrical generators is described in the chapter by T J Fielding in this week’s part. C Hamilton Ellis describes some of the great modern generating stations of Sweden. The article is concluded from part 34 and is the fourth in the series Wonders of Water Power. The evolution of machinery for producing motion in its various forms has necessitated the constant improvement of the brake, upon the efficiency of which the safety of millions of workers and travellers depends. Several chapters of Wonders of World Engineering have dealt with the subject of high speeds in transport, on rail and road, and in the air. This chapter deals with that important corollary of high-speed transport - efficient braking systems. Howard Barry describes the operation of various types of brake, hydraulic, compressed-air, magnetic and so forth which are used to-day for motor-cars, railway trains and aeroplanes. AUTOMATIC BRAKING SYSTEM FOR TRAILERS. The upper diagram show how the brakes are applied when the drawbar (left) connecting the trailer with the towing vehicles is not in tension. This position is automatically taken up when the towing vehicle reduces speed. When the drawbar is in tension (lower diagram) the brakes on the trailer are automatically releases. An electrical connexion from the brake pedal of the towing vehicle is the only braking connexion with the trailer. 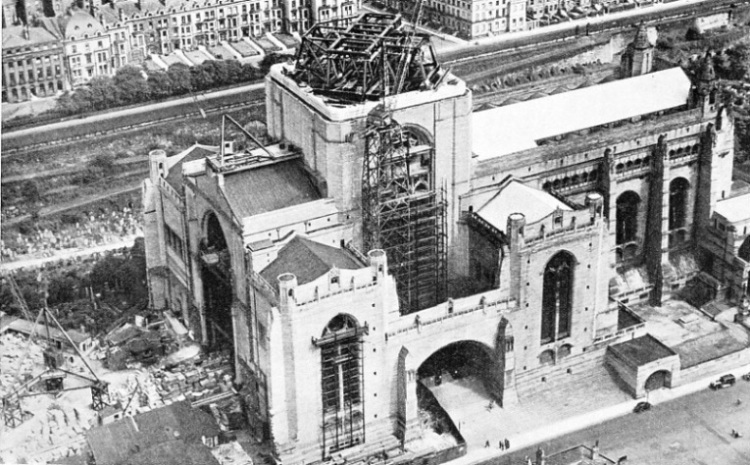 THE WESTERN TRANSEPT of Liverpool Cathedral, seen from the tower. In the left of the photograph is the partly completed wall of the transept. The wall which acts as a buttress to the central tower is 12 feet thick. The width across the transepts is 197 feet. For the transepts and the choir 823,500 cubic feet of stone were used, as well as 6,500,000 bricks and 2,650 tons of cement. The development of railways came about largely through the enterprise and foresight of George Stephenson, whose engine Locomotion No. 1 was the first in history to haul a trainload of fare-paying passengers. The story of the later life of George Stephenson, the village boy whose unremitting industry brought railways into being, has been written in endless lines of gleaming steel. The history of his earlier years is little known. Born on June 9, 1781, in a little cottage at Wylam, some eight miles west of Newcastle-on-Tyne, George Stephenson was the son of a colliery fireman who earned twelve shillings a week. As George was one of six children, he was set to work as soon as he was able to earn anything. His first job was to herd cows at a wage of twopence a day. Hoeing turnips and similar farm jobs when he was older brought in a little more remuneration. Then the boy was greatly elated at being taken on at the colliery at which his father worked. The boy’s task was to pick shale from coal and, later, to drive the horse working the gin (hoisting machine) by which the coals were drawn from the pit. He had set his heart, however, on becoming an engineman. He was a proud boy when, at the age of fourteen, he was appointed assistant fireman at a shilling a day. By the time he was seventeen he had realized his ambition, for he was assistant engineman at a new pit where his father was fireman. In his new post George Stephenson set himself to study the engine, taking it adrift and cleaning it with anxious care. Eighteen found him doing a man’s work, although he had not learned to read. So he attended a night-school and laboured hard with slate and pencil. born Robert Stephenson, the son who was to follow closely in the father’s footsteps. Then followed a move, in 1805, full of fate for George Stephenson. This was to Killingworth, seven miles north of Newcastle. He went there as brakesman, that is, in charge of the winding engines which had then taken the place of the old horse-gin but scarcely had he settled down when be became a widower. Under the stress of grief Stephenson took a job in connexion with a Boulton and Watt engine, at Montrose, Angus, leaving his small son to the care of friends. Stephenson remained there a year, returning to find his father had been blinded in an accident. Thereafter Stephenson entirely supported his parents, while working at his former job. In 1810, a new pit having been sunk, the Newcomen pumping engine built by Smeaton failed to keep it dry. Stephenson was appealed to. He lost no time in putting the engine right, a feat which led to his advancement, first to engineman and finally to enginewright to a group of collieries. During these years a colliery owner, Mr. Blackett, of Wylam, made the acquaintance of Richard Trevithick and realized the importance of mechanical haulage. Before long, therefore, two or three crude locomotives were to be seen on the tramway that ran past Stephenson’s birthplace. Stephenson studied these machines and was eventually entrusted with the building of a locomotive for Killingworth. This engine, the Blucher, was set to work in 1814, and was followed next year by a greatly improved locomotive. The success of the Killingworth engines led to the employment of Stephenson as engineer for an 8-miles colliery line at Hetton, Co. Durham. For this line, opened in 1822, he made five engines. In 1821, however, Stephenson had secured the interest of Edward Pease, the projector of the Stockton and Darlington Railway. Having been appointed engineer to this line, Stephenson had it ready for traffic by 1825, and upon it fare-paying passengers were carried by a steam train for the first time in history. The first engine, Locomotion No. 1, is still to be seen at Bank Top Station, Darlington. Then came the Liverpool and Manchester Railway, and the building and triumph, at the Rainhill (Lancashire) trials of 1829, of the famous Rocket. 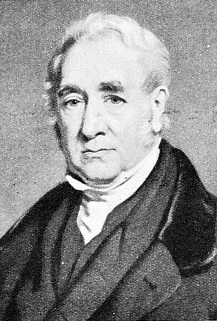 It is still commonly stated that George Stephenson invented the locomotive, but it had been developing for twenty-one years when Locomotion No. 1 came into being, Trevithick’s Peny-darran engine having been at work in 1804 (see page 356). Stephenson was endowed with a remarkable degree of foresight which enabled him to visualize the part the railway would play in the world. His perseverance, energy and genius converted visions into realities. After Rainhill the career of Stephenson was one of unbroken success until it was ended by his death on August 12, 1848. As he was the first President of the Institution of Mechanical Engineers, the portrait of George Stephenson adorns the official documents of that body and his memory is justly kept alive in many other ways and places. 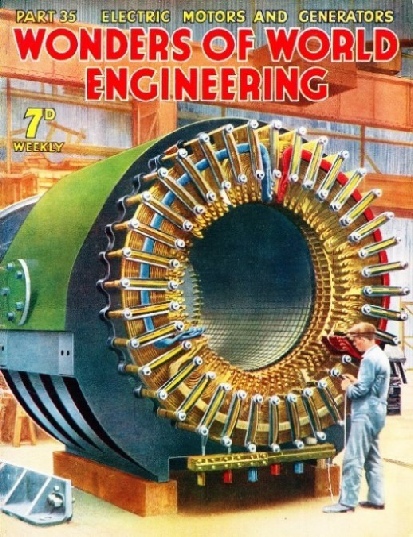 This is the twelfth article in the series Makers of Engineering History. TURBINES AND ALTERNATORS in Trollhattan Power Station are covered in huge casings painted green. 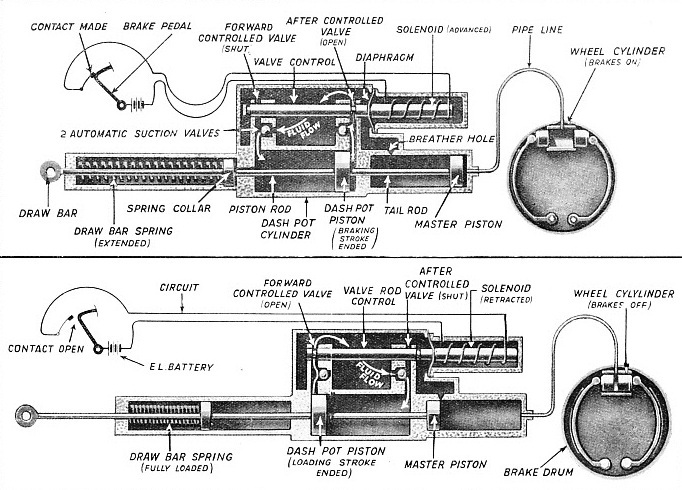 The alternator casings are made of cast iron. Each alternator weighs 191 tons; the stator and its casing alone weighs 102 tons. MASSIVE STEELWORK of the tower which carries the ringing chamber and bells of Liverpool Cathedral. This photograph shows the free ends of two of the steel girders. Each girder rests on a cylindrical rocker which ensures that in all conditions of loading the weight is carried on the centre of the bearing. 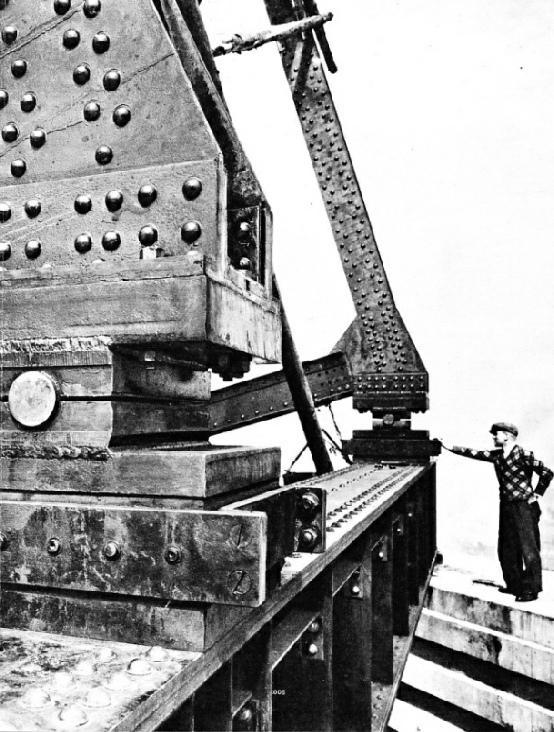 The man seen in the photograph is standing on the concrete girdle upon which the steelwork rests. Electrical engineering was founded on the discoveries of Michael Faraday little more than a hundred years ago. 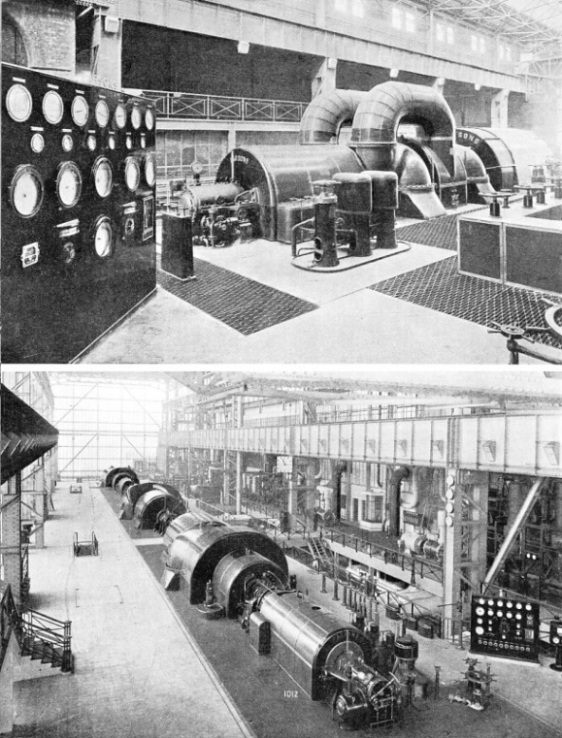 The enormous turbo-generators of the modern power station are striking examples of what the electrical engineer ha achieved in a century. This chapter is by T J Fielding. 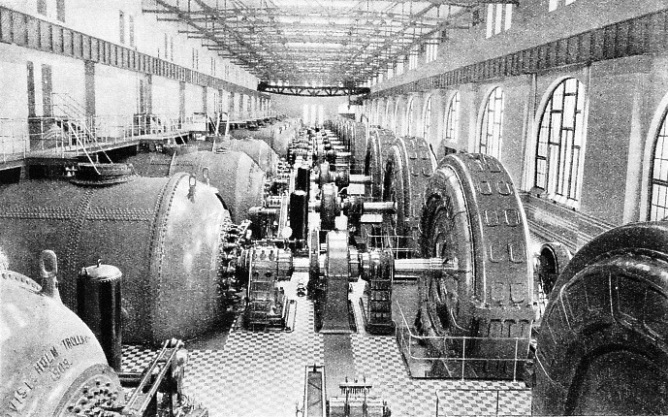 30,000-KILOWATTS TURBO-ALTERNATORS generate current at a pressure of 36,000 volts at the Hardingstone Junction Generating Station of the Northampton Electric Light & Power Co Ltd. The great Parsons turbo-alternators have a speed of 3,000 revolutions a minute. IN THE HUGE POWER STATION at Dunston-on-Tyne the Parsons turbo-generating plant has an output of 150,000 kilowatts. There are three 50,000-kilowatts turbo-generators running at 1,500 revolutions a minute. The introduction of the sound film brought about a revolution in the cinema industry, which, although comparatively new, has been developed continuously by the invention of new processes. A later development, the colour film, is now a commercial success. This chapter is by F E Dean and is concluded in part 36. It is the fourth article in the series Invention and Development. The first part of the Story of the Cinematograph appears in part 32 and part 33. LIVERPOOL CATHEDRAL as seen from the north. The choir is 116 feet high and the inside vaulting of the central tower us 176 ft 6 in above the floor of the cathedral. 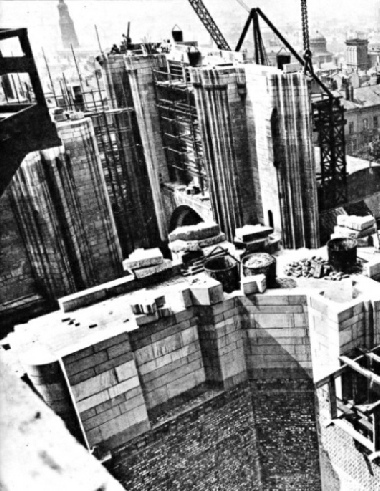 At a height of 179 feet work was begun on the main tower and belfry. The completed tower will be 97 feet square and will reach a height of 331 feet above the floor. The steel scaffolding on the north face contains an electric lift for the use of workmen on the tower. The twin cranes have a capacity of 3 tons and a radius of 52 feet. The northern arms of the transepts can be seen completed, but the nave, which will be the same size as the choir, is still to be built. The east window, the largest in Great Britain, if not in the world, is 76 feet high and 44 feet wide. Engineering skill is required not only in the building of a great cathedral, but also in the rebuilding or strengthening of many structures which have weakened in the course of centuries. The close association between the engineer and the architect is a noticeable feature of modem building construction. The architect who designs and supervises the building of a modern skyscraper, cinema or store comes in close contact with electrical engineers, sanitary engineers, experts in metallurgy, in physics and in any number of different branches of engineering. Yet the association of the two professions, architecture and engineering, is not altogether a recent development. For instance, they were closely linked in the Roman aqueduct, of which many examples survive in Europe. Many of the works that the medieval builders carried out still stand to-day, timeless monuments to the skill of craftsmen and artists of forgotten ages. The wonderful cathedral of St. David’s, at the westernmost extremity of Wales, is a remarkable example of the excellence of twelfth-century architecture and of the deficiencies of twelfth-century engineering. Built on marshy ground at the side of a small stream, the structure has suffered from insufficiently strong foundations. The floor of the nave slopes upwards to the altar, which is now much higher than the level of the west doorway. The columns and arches have a noticeable inclination out of the vertical and the whole building has the appearance of having been warped by a subsidence or minor earthquake. At present a full appreciation of the artistic qualities of this ancient structure is handicapped by the amount of scaffolding which marks the efforts of the engineer to remedy the defective work of the early cathedral builders. The builders of the medieval cathedrals did wonderful work. There are innumerable examples of buildings in Great Britain alone which have withstood for centuries the effects of wind and storm, and which have resisted the wear of continual use to a remarkable degree. But there are also many buildings which have to be repaired or restored with the aid of modern engineering skill. In 1925 the famous Cathedral of St. Paul's, situated right in the City of London, was pronounced dangerous. Subsidence of the foundations had weakened the structure that supports the huge dome. Immediately the engineers devised a means of strengthening the supporting piers and circumventing the thrust of the dome, which was causing its diameter to increase. Cement was grouted into the piers and a huge chain of stainless steel was bound round the dome to prevent it from spreading. The work took five years and cost nearly £500,000. This and similar work is described in this chapter by Harold Shepstone. The excavation of the foundations and the composition of brickwork, stonework and steel girders which has gradually accumulated on the site in the last three decades are all described in this chapter. In a way, this chapter supplements the chapter in Part 17 which describes the engineer’s part in building the great American skyscrapers. 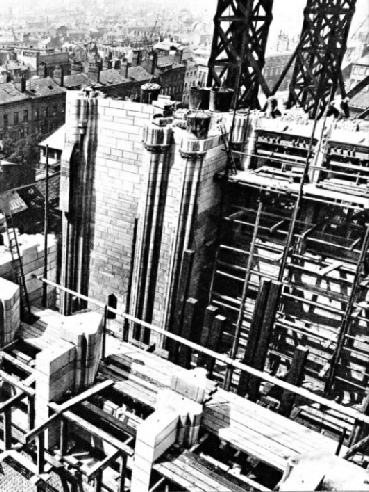 THE BELFRY OF LIVERPOOL CATHEDRAL in course of construction. At a height of about 180 feet above the floor of the cathedral is a concrete girdle in the tower. The concrete girdle carries the steel girders which are designed to support the ringing chamber. At this stage of the work the choir and transepts had been completed, but the central tower and the nave were still to be built. IN THE PROJECTION BOX of the Mayfair Cinema, Liverpool, where the “Mirrophonic” system of sound reproduction is used. Sound is reproduced from a sound track incorporated into the film itself. 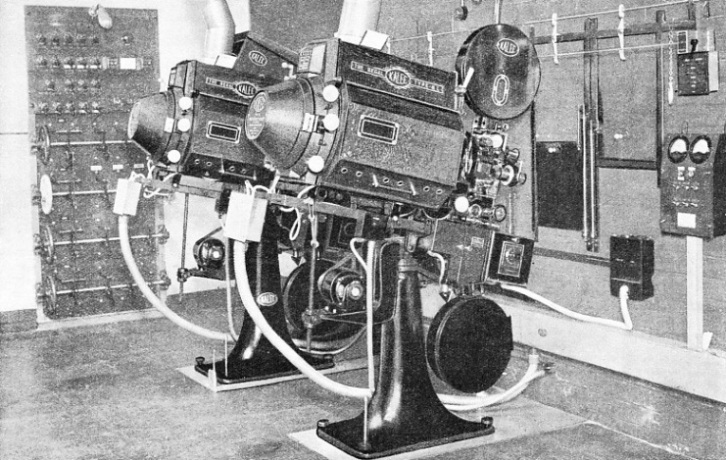 When the reel in one projector is finished, the second projector comes immediately into operation. A special changeover switching device ensures the continuity of synchronous sound reproduction.